Oracle Team USA Spithill bounced back from capsizing in the first fleet race on Saturday to win the match racing championship at the Americas Cup World Series San Francisco. 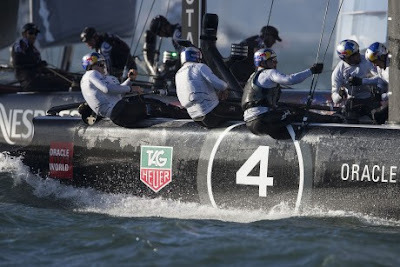 With little damage to the AC45, skipper Jimmy Spithill and crew were back racing for the second fleet race and the match final, and they are tied for fourth place overall with the Super Sunday fleet final ahead. 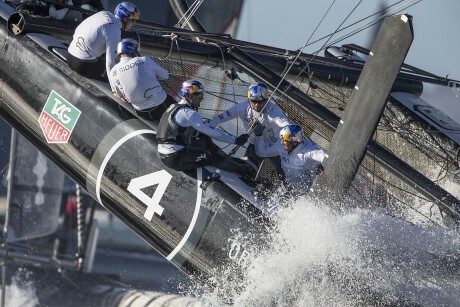 Oracle Team USA Spithill took a lot of speed into the first mark when both bows went into the water. 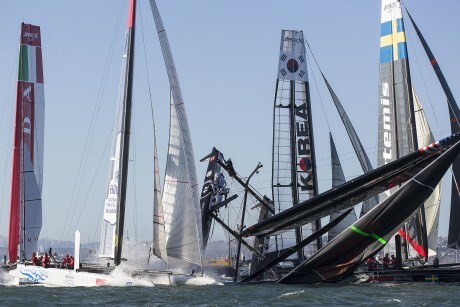 The boat stopped and nose dived into the San Francisco Bay. All crew were safe. 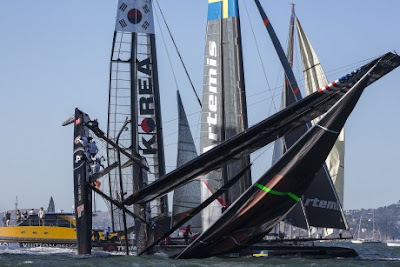 The Oracle Team USA support team quickly pulled the boat back up and got it back ready to race. Spithill opened the day’s racing with a win vs. Artemis Racing - White in the match racing semifinals to advance to the final. After not finishing the first fleet race, they returned to the course and gradually moved up the leaderboard to finish second in the sixth fleet race of the regatta. In the match racing final, Oracle Team USA Spithill faced Emirates Team New Zealand and both boats filed a penalty off the start. But, no fouls were ruled on either side. Spithill took the start and held the lead, crossing the line 19 seconds ahead. 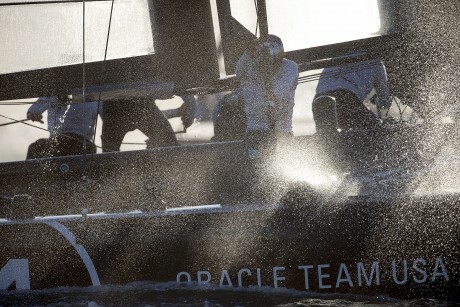 Oracle Team USA Coutts finished in eight and 10th-place, respectively, in the day’s two fleet races. With Russell Coutts at the helm, the crew has 31 points and is eighth in the fleet racing standings. Oracle Team USA Coutts sits only 16 points out of third place heading into Sunday’s bonus scoring round. The Super Sunday fleet racing final begins at 1:55 PM local. Bonus points are on the table, including 40 points to the race No. 7 winner, opening the door for the potential of big changes on the leaderboard. This week’s ACWS is being held in conjunction with Fleet Week, and an air show and celebration will take place on Marina Green. NBC will broadcast the “Super Sunday” fleet racing final live nationwide along with the match racing final on Sunday, Oct. 7. The 11 boat fleet: Luna Rossa Piranha (Chris Draper), Team Korea (Peter Burling), Energy Team (Loick Peyron), Luna Rossa Swordfish (Iker Martinez), Artemis Racing – White (Terry Hutchinson), Emirates Team New Zealand (Dean Barker), Artemis Racing – Red (Nathan Outteridge), J.P. Morgan BAR (Ben Ainslie) and China Team (Phil Robertson). Oracle Team USA Spithill – Jimmy Spithill (helmsman), Dirk de Ridder (wing trimmer), John Kostecki (tactician), Joe Newton (headsail trimmer), Jonathan MacBeth (bowman). 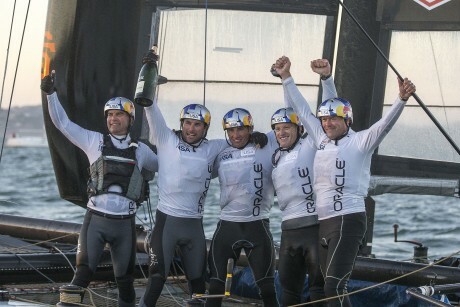 Oracle Team USA Coutts – Russell Coutts (helmsman), Sam Newton (wing trimmer), Tom Slingsby (tactician), Rome Kirby (headsail trimmer), Piet van Nieuwenhuijzen (bowman).